Seven wayang figures are depicted, three on the left and four on the right. An audience scene is depicted. On the left a king, Rawana, sitting in an armchair while his son Indrajit or Meganada is standing behind him and his servant sitting on the floor is holding a woven bag on his shoulder for sirih utensils. Texts in Balinese script in ink give the names of the characters; top left: “méganada”. Méganada is a son of the king of Langka. Bottom right: “rawanna”, Rawana, the king of Lankga, and bottom left: “sangut”, the name of the second servant of the figures of the “left” party. To the right a group of four demonic figures is depicted, two of them are standing and two are sitting. The man standing to the left makes a gesture of obeisance with his hands. His name is written on Balinese script on top of his head: ‘patihprasta”, Prasta, advisor of the king. The man behind him is, according to the text, “patihsukasranna”, Sukasrana, advisor of the king. The two men crouching at their feet are, left, “butahungu”, Buta Ungu (=violet, but the colour of his body is brown), and to the right, close to the demonic figure with the speckled body, “sangnganoman malingsé dadi buta”, Hanoman disguised as a demon. A meeting between Prahasta and Sukasrana, both advisors of the king, and Rawana accompanied by his son Méganada and his servant Sangut is depicted. The advisors are accompanies by two demons of lower rank, named Ungu and Hanoman in disguise. This scene is not explicitly described in the Old Javanese Ramayana, but in VIII: 69-80 a transformation of Hanoman is described. Upon his arrival in Langka, he changes into a demon because he does not want to be recognized as a monkey by the demons. He wants to know what Rawana looks like, so he enters the palace where Rawana sleeps. He discovers Rawana. Sita, however, is not with him. Hanoman then changes back to what he normally looks like and continues his search for Sita. 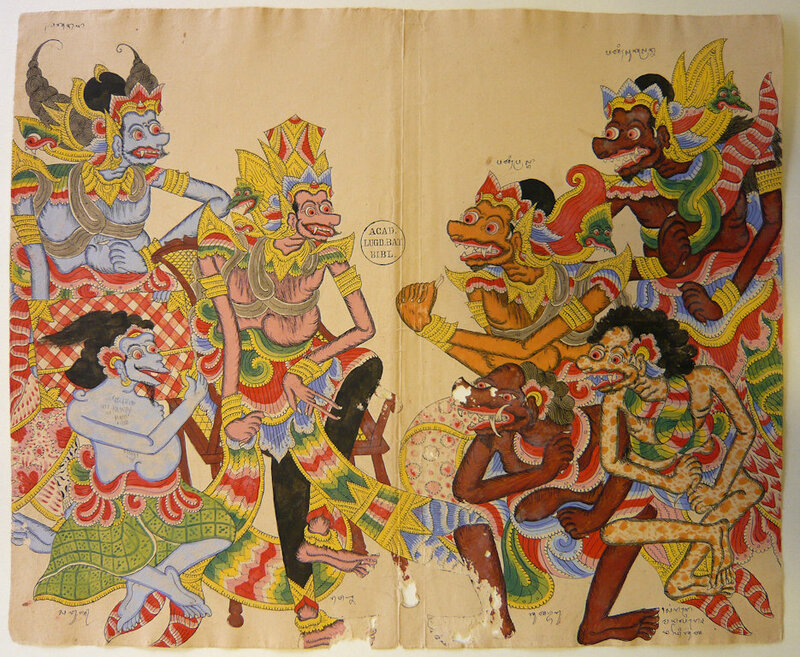 A somewhat different version, probably based on a local wayang version, in which Hanoman disguised as a demon forms part of Prahasat’s suite, is represented in the drawing. The object held by Sangut is a kampèk. This is a large, flat bag made of basketwork in which sirih utensils are kept in the compartments inside the bag. These utensils consist of sirih leaves, chalk made form sea shells, gambir, pinang nuts, a pinang cutter, and tobacco.